Today was Mama Linda's appointment with the knee surgeon. We (me, Mama, Pops and Robert) all went together so we can jointly be there for Mama and learn more about the surgery that the doctor has asked her to undergo at the soonest possible time. Mama is scheduled for surgery on October 28th. She in going to undergo knee arthroplasty -- more popularly known as knee replacement. 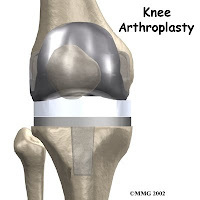 Knee replacement is surgery for people with severe knee damage. Knee replacement can relieve pain and allow her to be more active. When you have a total knee replacement, the surgeon removes damaged cartilage and bone from the surface of her knee joint and replaces them with a man-made surface of metal and plastic. The doctor said that recovery period is three months -- sessions with the physical therapist thrice a week and home therapy twice a week.